In Austro-Hungarian statistical records, according to Adolf Fiker, Serbs (of all three faiths, according to the statistics) made up 88.9% of Dalmatia, with Albanians composing, 0.2% and Italians the rest. 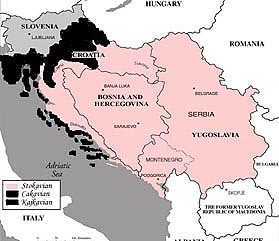 Many "Croats," such as those in Herzegovina and around Dubrovnik and all of Dalmatia are the descendants of Serb converts to Catholicism by Franciscan monks. The Croats have been the most vile enemies of the Serbs in our history. The following is a list of Croatian academics who affirm that contemporary "Croatian language" is simply a usurped form of Serbian. The original Croatian language was the kaykavian-chakavian idiom now marginalized as a dialect, but today in Croatia the shtokavian dialect is being used as the official language because most Croats do not speak kaykavian-chakavian (yet only 20% do). The information below will show that kaykavian-chakavian is being deliberately marginalized to increase the number of "Croats" by falsely using Catholicism as an identifying marker of "Croatianness". gramatiku budemo imali odijeljenu od srbske"
(Jagić, Spomeni mojega života, 62). "pravi Hrvati preko Kupe stanuju". "Mislim da smo već na dobrom putu. dijelom srpska inačica Vukovoga rječnika. "Ukrali ste nam jezik i još ste ga uništili". To se kao ne smije reći, a to svi znaju." kako kod kuće tako u javnom životu. oslobođenoj, srpski je raspravni jezik"
ujedinjuju se svi Hrvati u jedan književni jezik štokavskog tipa. 1000 forinti za tiskanje Vukovih još neizdanih spisa. darovan već usvojen hrvatskom pomirljivošću i naivnošću. stvorio je neprirodnog blizanca – srpskog doppelgangera. padao je u zaborav. Međutim, zastor još nije pao, moć pamćenja je moć života. rooted Croatian language was considered "counterrevolutionary." popularize the new hybrid of "Serbo-Croatian language." this centralistic attempt will also fail. 1380-1400 u Dubrovniku kao prijepis s čakavskoga izvornika. Below is an article from istrianet.org – a Croatian website, which asserts that Istrian chakavian preserves the oldest Croatian words. This is obvious since shtokavian has been shown to be distinctly Serbian and thus non-Croatian since it came to be used by Croats in the last few hundred years at a time when large numbers of Catholic Serbs began being absorbed into the Croatian ethnios (see article on Bosnia and Herzegovina). The article incorrectly refers to chakavian-kaykavian as a "dialect". However, the article contradicts itself because a dialects of a language cannot contain more "original words" than the standard language. The fact that chakavian-kaykavian contain more original Croatian words than shtokavian makes it self-evident that shtokavian is not an authentic Croatian idiom. As has been shown it is a late borrowing from Serbian. reside between the two beautiful inlets of Plomin and Rasa. Brac, Trogir, and the inhabitants of Komize on the island of Vis. the first slav inhabitants of Istria. of its use among the people of Labin. Below are samples of chakavian-kaykavian poetry written today by those who can speak the true Croat language. 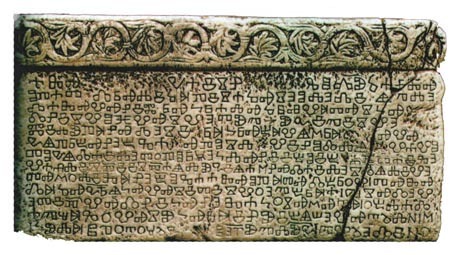 Compare its simmilarity with the language of the Baška Tablet and you will see an obvious continuity. da čovik ni bi lin! od kad su iz nje kavaduri utekli! ne bi se čovik obo vrimenu sa gušton razgovara. parila bi mu snaga tri puta manja. parilo bi da puše priko voje. - koliko da je strankinja! hoće reć da se čovik oženi vanka. ka da je sirota - mulica. Po guštu je samo Š k o j a r k a.
bez tabaka doc u petradu. i uz Podbrdje, senca skerci, kapu na celo! a mater svakako da ono ne zaboravi. This is the earliest source referring to Serbs OR Croats in modern day Croatia (Krajina: consisting of Banija, Kordun, Lika and Northern Dalmatia) and it suggests that all other LATER references to Croats instead of Serbs in this region are actually references to a Croatianized SERB population. Since the Chronicles mention Serbs in Lika in the 700s this suggests that the population was croatianized by Tomislav in the 10th century when he built the mighty empire described in DAI. partem obtinere dicitur, fugiendo se contulit"
All the quotes which have been listed are those of academics of CROATIAN ethnicity. No Serb sources were used to prove that 4/5 of modern Croatia is of Serb ethnicity or that contemporary standard Croatian is a version of the Serbian language.